Pottermore has a brand new posting about the second of the Fantastic Beasts movies. Fantastic Beasts: The Crimes of Grindelwald is due to be released one year from this date. Last edited by Prof. Tarma Amelia Black on Fri Nov 17, 2017 6:33 pm, edited 2 times in total. I already knew that Grindelwald had pale blond hair -- and it doesn't seem much of a step to bleach it white. As a young man, Grindelwald had golden blond hair and a "merry, wild" face. Picture of Grindelwald as he is stealing the Elder Wand from Mykew Gregorovitch. Another picture of Albus Dumbledore of that time period. I was at work when someone brought this to my attention. Thankfully we were in the break room, and I screamed out of pure excitement as I read the article. One of my managers came into check on us to make sure we were okay. haha It was awesome. So I got to go on this crazy dialogue about how amazing this movie is going to be and how excited I am for it, and the actors look perfect and Queenie!!!!!!!!!!!!!!!!!!!!!! And Jacob!!!!!!!!!!!!!!!!!!!!!!!!! I'm going to love seeing them together again. And also...omg! WILL WE GET TO SEE THE DUEL BETWEEN GRINDELWALD AND DUMBLEDORE IN THIS????? I received an email from Pottermore and I immediately looked at it. 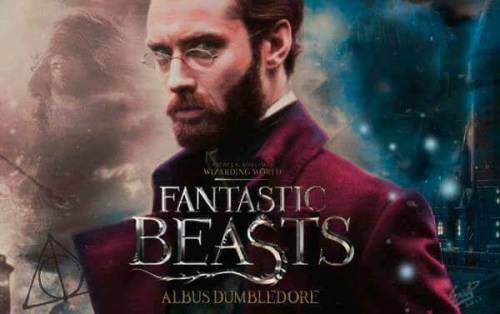 Jude Law as Dumbledore looks amazing! I think the cast will really put itself together soon. I also love Leta Lestrange. When I was looking at Jude Law as Dumbledore, he reminded me of someone. I never heard the name Jude Law in my life before, and yet he looks familiar. Are there other actors or famous movies Jude Law played in? Also, do you think Johnny Depp makes for a good Grindelwald? Johnny Depp as Grindelwald? There are some who say a resounding 'no'. I'm not one of them. I think he has the acting chops to pull it off. He's very much the chameleon. I really do look forward to the movie! That's probably wher I've seen Jude Law before, thank you Tarma. As for Johnny Jepp as Grindlewald I think that we've seen him only for a few minutes, and can't make a coherent conclusion about his being Grindlewald yet. However, I think he'll do well as Grindlewald in the next film. Oh my god!! I'm so excited.. I am the one who vote he will doing well..
Can't wait the to see how the stories unfold. JUDE LAW plays a young ALBUS DUMBLEDORE, taking on the mantle of one of J.K. Rowling's most beloved characters; EZRA MILLER makes a return as the enigmatic CREDENCE, whose fate was unknown at the end of the first film; CLAUDIA KIM appears as a Maledictus, the carrier of a blood curse that destines her ultimately to transform into a beast; ZOË KRAVITZ plays LETA LESTRANGE, who had once been close to Newt Scamander but is now engaged to his brother; CALLUM TURNER joins the cast as Newt's older brother, THESEUS SCAMANDER, a celebrated war hero and the Head of the Auror Office at the British Ministry of Magic; KATHERINE WATERSTON returns as TINA GOLDSTEIN, who has been reinstated as an Auror for MACUSA; EDDIE REDMAYNE stars again as wizarding world Magizoologist NEWT SCAMANDER, who has now gained fame in the wizarding world as the author of Fantastic Beasts and Where to Find Them; DAN FOGLER reprises the role of the only No-Maj in the group, JACOB KOWALSKI; ALISON SUDOL reprises the part of Tina's free-spirited sister, QUEENIE GOLDSTEIN, a Legilimens who can read minds; and JOHNNY DEPP returns as the powerful Dark wizard GELLERT GRINDELWALD in Warner Bros. Pictures' "FANTASTIC BEASTS: THE CRIMES OF GRINDELWALD." Pottermore information on the cast: click -- be aware, spoilers! Would *I* go to that book launch? Oh, yes! Pottermore announced the first official trailer for Fantastic Beasts: The Crimes of Grindelwald! So there we are – our first trailer for the second film in the Fantastic Beasts series: Newt Scamander heads to Paris, Grindelwald is on the rise and we get to go back to Hogwarts School of Witchcraft and Wizardry. Prof. Tarma Amelia Black wrote: Pottermore announced the first official trailer for Fantastic Beasts: The Crimes of Grindelwald! They’re probably afraid of the backlash. There was so much anger over the anonouncment that Johnny Depp was playing Grindelwald, so they’re probably trying not to raise much attention about it. I love the small things I’ve seen so far. Dumbledore looks amazing and Newt too. I love the scene where they’re flying on a green/blue creature. It looks so magical. What impressed me most of that promo is that ... okay a few things impressed me! I love that Jacob is back and, in that one scene, he is 'heroic'. What was that water creature (was it a creature or a plant?) that it appeared that Newt (was that Newt?) was riding (was it underwater?) I have to go watch it again! I think that it is a fine thing that Jude Law is portraying Dumbledore. I wondered, at first, if he could do it -- but the tiny tidbits of information shown so far point to something which works very nicely. I absolutely love the little byplay of Albus Dumbledore and Newt Scamander -- that someone has to deal with Grindelwald and Dumbledore, himself, cannot do it and ... somehow ... Dumbledore conveys the feeling that, if anyone can, it's Newt. So I watched it a few more times. "If you'd ever had the pleasure to teach him, you'd know Newt is not a great follower of orders." "I can't move against anyone. It has to be you." Prof. Tarma Amelia Black wrote: I think that it is a fine thing that Jude Law is portraying Dumbledore. I wondered, at first, if he could do it -- but the tiny tidbits of information shown so far point to something which works very nicely. That is one of the points where I don't agree with a lot of the critics. I think Jude Law is a very fine actor, and he has great facial expressions (especially in his eyes/eyebrows) which I think is exactly what Dumbledore needs. The trailer even proves that he has a way about speaking, kindly, even jokingly, but still clearly strong. I'm pretty excited for it! Some more information is posted on Pottermore - this time 10 revelations about the movie. 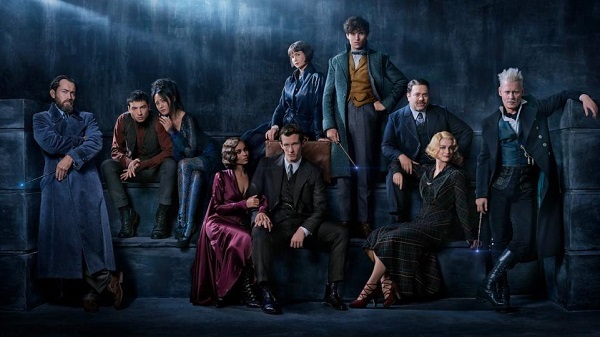 The cast and production team from The Crimes of Grindelwald have divulged a few secrets from the upcoming film. Here’s a few things we thought you’d like to know – so beware of spoilers. Newt's brother (Theseus) is ALSO a Hufflepuff! Fantastic Beasts: The Crimes of Grindelwald will have its world premiere at the UGC Ciné Cité Bercy in Paris on 8 November 2018 and is scheduled to be released worldwide by Warner Bros. Pictures on 16 November 2018.